When there was a need to have the test specimen stay in position while performing tests, often times tape would be used. Taping for every test can get time-consuming and tedious. As a result, the hold down bracket was designed. 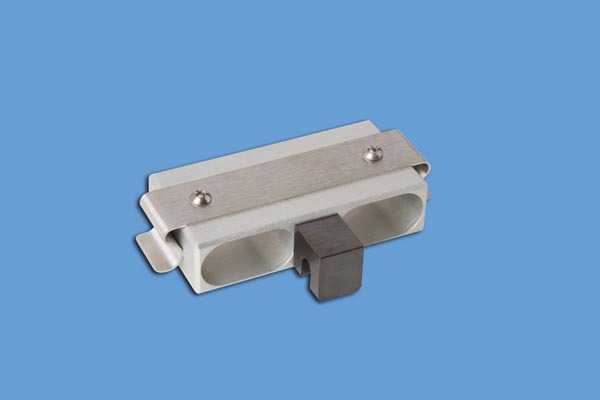 This bracket allows the user to simply turn two wing nuts to secure or release the test specimen. This item comes standard with all new machines. We offer this item as an aftermarket item for those who would like this convenience. The item is easily installed and functional after installation. Refer to the instruction section for the installation. Pictured is the hold down clip installed on a machine. 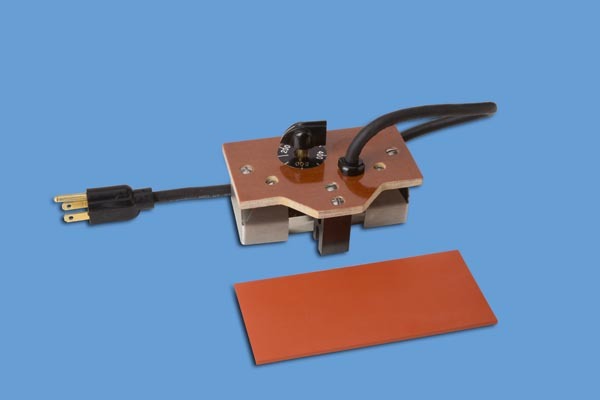 This heated weight provides a uniform test for evaluating the "hot abrasion" resistance of printed cartons, labels, and periodicals. Where required, rub resistance specifications may now be based on the number of strokes at a given temperature as well as pressure. 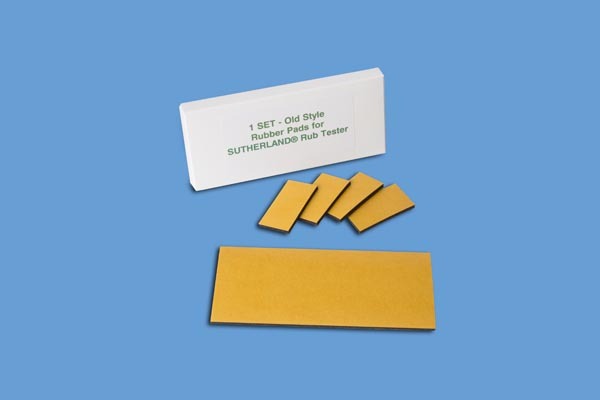 Before putting the weight into service, replace the natural black rubber pads on the SUTHERLAND® Rub Tester base with the silicone pad furnished. Peel the cover from the adhesive and apply the pad directly to the clean base. CLICK HERE for the suggested procedure for Heat Abrasion Testing. 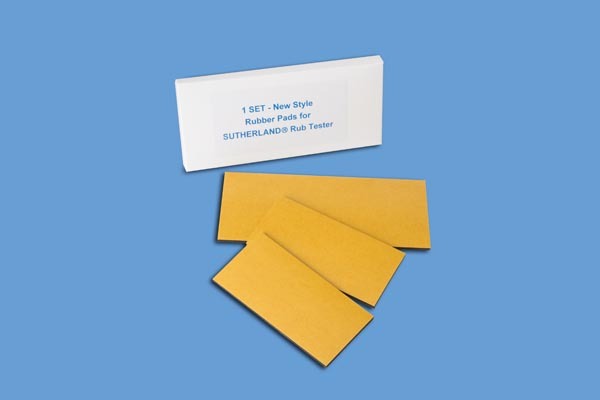 Each weight product offered by Danilee Co. is used for different intensities of testing with the Sutherland Rub Tester. Because we specialize in rub testing equipment, we can supply various other weights (such as kilogram weights) on request. Pictured is the half-pound optional weight. The pads should be changed when they become hard or damaged from age and use. Recommendation is a six (6) month minimum. 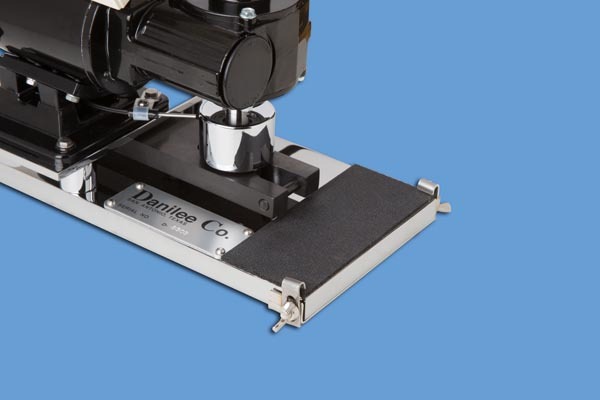 These can be ordered from DANILEE CO., LLC. To replace pads, clean metal surface with solvent such as naphtha. Remove protective back from pressure-sensitive surface. Press this surface to the metal in the proper location. Each set of "old style" pads comes with a base pad (2 5/8" x 6") and four (4) small pads (1" x 2"). The large pad fits the base at the end of the arm. The small pads are placed at each end on the bottom of the two and four pound weights. Pads should be changed a minimum of every six (6) months. Each set of "new style" pads comes with a base pad (2 5/8" x 6") and two (2) small pads (2" x 4"). The large pad fits the base at the end of the arm. The small pads are placed on the bottom of the two and four pound weights. Both styles of pads are stock items. In 1990 ASTM determined that the new style pad with its complete coverage of the weight provided more consistent and reliable results. Note: if changing from "old style" pads to the "new style" pads, new test procedures may be required as the "new style" pads require more rubs to achieve the same results as the "old style" pads. The reason for this is that the "new style" pads decreases the PSI (pounds per square inch) as the weight is being spread over a larger contact area. The silicone pad pictured should be used with the heated weight. The pad may also be used for specific tests requiring a firmer substrate foundation.